Parents love screen free activities for kids to keep them busy at home, while eating out or when they accompany them on errands. Sharing a simple idea of Busy Boxes. These utilize things already at home and require minimal time to set up but are sure to entertain your little ones. Now that Zeynab goes to school full day, my little boy gives me company all day as we run errands, keep appointments and take care of chores at home. I came up with the idea of a Busy Box to keep him engaged and occupied without having to resort to the iPad (which I do keep on hand for emergencies and as a backup – I’m no saint!). To set up a Busy Box you need a box lying around at home. I used an old lunch box. It helped that this one had a handle and my three-year-old loves carrying it around (looking like the world’s most adorable insurance salesperson). I then add an assortment of toys in the box. These can be ones that have been at the back of the toy drawer for a long time or you can follow a theme such as animals, lego pieces, colour theme, toys to make up a story etc. We open the box when the need arises! I encourage my little one to explore the box and it’s contents. Sometimes I add a surprise snack. Sometimes we sing a song to get him started. 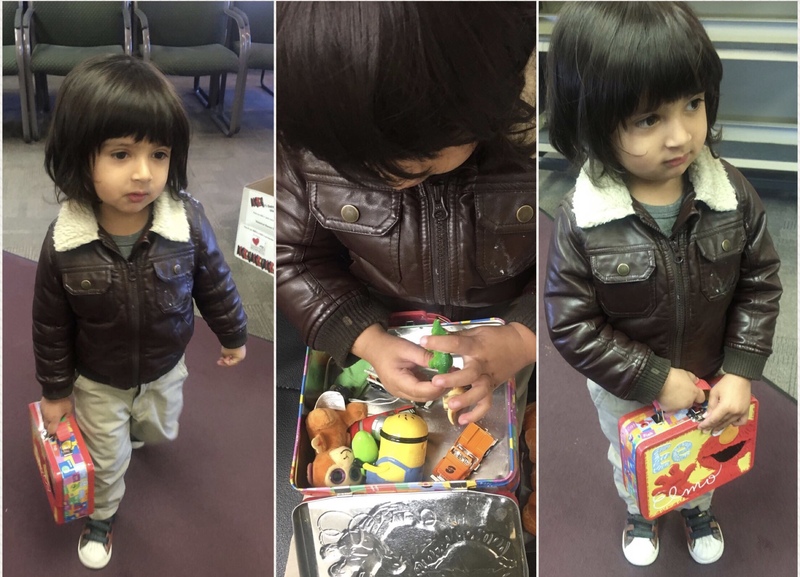 The purpose of a Busy Box is however to engage independent play so I always direct him gently to explore the box and get “busy” just like Mom. For older children you can make a Busy Box with items matching the personality and interests of the child such as the “crafty” theme box I made for my seven-year-old daughter. I used a really pretty old chocolate box for her. It’s important to customize each Busy Box for the child so that they feel special. We now have two Busy Boxes for my two kids lying ready in the car for when the need arises. I keep changing the contents to maintain their interest and curiosity. One sure hit in our Busy Boxes for both kids has been this “water game” that I found in Islamabad. It reminded me of my childhood because I loved it as a kid and I was really happy that my children enjoy it too! Do you remember these? What are some Screen Free Activities for Kids that you love while on the go? I always carry a pencil and paper and tell them to draw, play name place animal thing game( noun with each letter) or write the spellings you see on the roads..thats so interesting for them. Good idea to contain stuff in a box! I gather up some books, coloring book, crayon box and a small snack for my 4 yr old daughter and we make a “library bag” kind of thing to take! For my older ones, it’s a little harder, cuz younger boy follows older boy who thinks he’s a teen at 10 😍😍😎😎😎 Ma sha Allah. So he has his thick novels..and the 7 yr old is left to choose what he would prefer! Hmm, I should be customizing a box for him too.